Remember those unknown, starving, but up-and-coming artists from the early-nineties - Lite Metal, Yoko, Christin P., Karl Gitter and Krypto? You first met them in the now-classic Reiner Kniszia game Modern Art. Now, almost 20 years later, they have all found fame and fortune in the art world and their masterpieces are displayed in major galleries around the world. But even with their success, the group's artistic rivalry remains as lively as ever. Whose work sells for the most? Which one has the highest standing in the minds of the art-buying public? In Modern Art: The Card Game, the players are art critics, collectors and gallery owners. All have their own favourite artist in this pantheon of greats - or at least they do until the game begins. As it is in art galleries the world over, tastes and opinions change constantly in the world of Modern Art. Today's treasure is tomorrow's trash, and no one has more influence on the artists' values than the players in this game. Which players will exert the most influence on the art market? Who will be the best at anticipating the quickly-changing tastes and opinions of buyers, and thus assemble the highest-valued collection of these new masters? 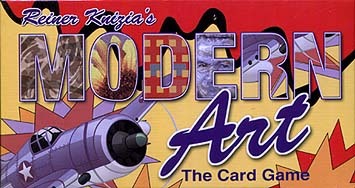 Only the most influential collector will come out on top in Modern Art: The Card Game!